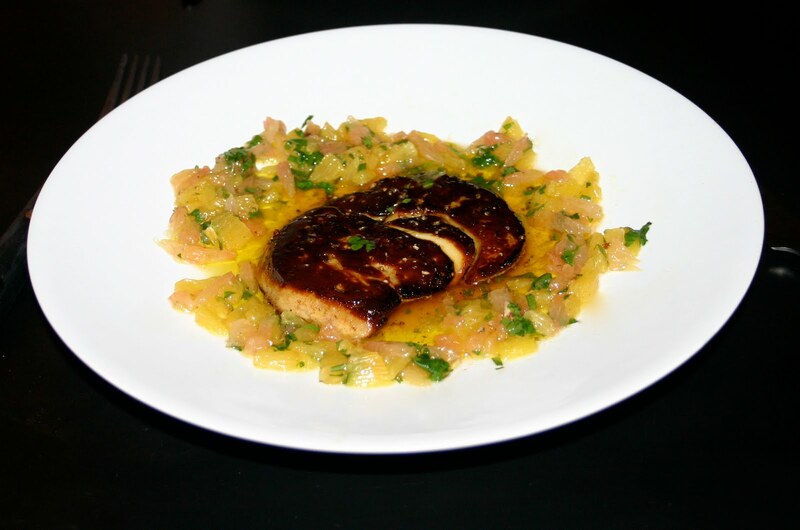 Foie gras de canard frais pôelé, vinaigrette d’agrumes à la coriandre – A TAVOLA ! Most important you need a very fresh duck liver. It has to be entire, firm and homogeneous. 1 grape fruit , 1 orange that you will peel. Then separate and extract with a thin knife all the quarters pulp of both fruits. Once done then slice them into very small pieces. Cover this “vinaigrette d’agrumes ” preparation with a thin plastic film and keep it in the fridge for an hour. With a large and pre heated knife, cut obliquely the liver in slices of 2cm thick. 1 slice per person. Put a bit of salt and pepper on both sides of the slices. Pre heat your plates in your oven. Bring a stoven to highest temperature. Take out your plates from the oven and spread your “vinaigrette d’agrumes” on the edge. Put your liver slices in the heated stoven without any oil or butter. Cook them no more then 2mn on both sides. When flipping them, take out the fat. Take them out from stoven. Quickly place them in a a cloth to remove the surface fat. Place the liver in the middle of the plate. Nancy, je te propose de passer la recette à la moulinette de Google Translate. cela devrait en gros te traduire tout cela. Dis moi si cela ne fonctionne pas bien. Mais c’est très facile à faire !! je peux avoir la recette en français ? ça a l’air trop bon ! Olive, envoie moi les photos de ce que vous préparez de bon ! Je les mettrai en ligne sur mon blog ! Avec la recette bien sûr !